Thanks to the very generous Susan Higginbotham, we have two copies of The Traitor's Wife to giveaway. When Susan guest posted for us last week, she offered up another alternative watching The Tudors, by suggesting that the Plantagenets would be interesting reads. In order to enter the giveaway, we would like you to tell us what other eras/families etc you like to read about, and yes, you can say the Tudors if you like! Unfortunately, due to high postage costs, this giveaway is restricted to US/Canada addresses. The winner will be chosen randomly from all entries received by Monday 13 April. Also, stay tuned as we will have another exciting giveaway this week as well. I can't think of an era I don't like reading about, although the medieval Plantagenets are not my favorites. Maybe a little William & Mary? Although I love to read about the Plantagenets and the Wars of the Roses eras, recently I've become more and more interested in pre-conquest Britain. I mostly read about the Plantagenets and the Tudors... But there's so much out there on those 2 families! Hmmm... I've mostly read Regency and Victorian era fiction. I think I'd enjoy reading about Alfred the Great and the age of Viking attacks - or possibly the pre-history of Stonehenge. I truly enjoy reading about the Plantagenets (a passion that was started actually when I first read The Traitor's Wife when it first came out a few years ago.) I would love to own my own copy of the Traitor's Wife to reread again since the first time I read it, I got it from the library. I am quite burnt out with the Tudors unless it is a minor character I know nothing about. No need to enter my name - I've just read this fabulous novel! But, thank you for the mention - I have an interview with Susan posted today! Great giveaway - you're going to have some very excited winners! I like the Tudors and the Medicis! Of course I love reading about the Tudors, but I also love reading about the Victorian era. I just finished reading Lisa See's Snow Flower and the Secret Fan and I'm hoping to read more about that era in China. Oh I'd love to win this! I really love books set during the Victorian era in England. Or really anywhere during that period. What a crazy time in the world. Thanks! I don't have an actual favorite, I loved everything that I've read so far. Makes me feel like I'm learning more deeply into the history of the world, even though it's fiction! It would make college classes more interesting though, that's for sure. and I'd love to read this book! I like to read about King Arthur. I'm personally just obssessed about the Tudors. I haven't read a lot of historical fiction, but I enjoy reading about the early 20th century. I love reading about the pharaohs in Egypt - Cleopatra, Ramses, and Nefertiti (obviously different time periods!). Really I like to read books set in any era. Dark Age Celtic, obviously :-), but I love the ancient world as a setting too, as well as the Tudors, Plantagenets, etc. Sharon Penman's Henry II Trilogy is awesome, I love that series. for some reason I can spell planta genista better then plantagenets. Please enter me in the drawing, it is still on my wishlist. Thanks! I'm really glad you said that The Tudors is an acceptable answer, because they really are my favorite historical subjects to read about. But really, anything involving English history, ancient Greece or Rome, or the slavery era all tend to be good reads. I think it's because of the complexity and historical impact involved. I love reading about the Medieval times, everything from Bede to St. Augustine to fiction like Ellis Peters. I enjoy the historical info on your blog, and I know I'd enjoy the book. Please enter me in the drawing as well! I also love reading about the 1920s and the extravagance of that decade. I love historical books. The Tudor dynasty is of course one of my favorites. I mean who cannot love all those political roller coaster. I also love reading about the medieval times and the times of cleopatra. I love reading about William and Mary...Mary has always been close to my heart! I love reading about all these dynasties--I also like reading about Italian dynasties as well! I'm dying to read this book...please sign me up! I am not surprised by the popularity of the Tudors. They are quite interesting and intriguing!! I prefer that era myself. I also love Victorian England Historical Fiction too! I am not too picky of reading subjects. I guess. I like reading about the Tudors!! I love all things Russian, and love reading about the Romanov's. 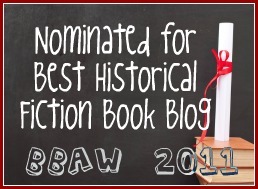 I love reading historical fiction so it is hard to choose just one family that I enjoy. I just finished Shanghai Girls by Lisa See so I am going to say that her historical novels are among my favorites. DEFINITELY the Julio-Claudian family (Rome). I enjoy anything having to do with Versailles... from the Sun King to Marie Antoinette. Well, I am currently in the middle of Sharon Penman's The Devil's Brood, which I never thought I'd be reading! It's a fascinating story, and Ms.Penman characterizes all of the participants very, very well. My favorite historical period is medieval, but I'll read about almost any historical period, as long as it's well-written and engaging, and doesn't "mess" too much with what is known(or what I know about it). Right now, I'm particularly drawn to the 1920s and the 1930s, but normally I'm interested the Renaissance period whether its in England, Italy, or elsewhere. I'd really love to read The Traitor's Wife - I'm a big fan of Marlowe's Edward II and I'd love a different take on the story. The Victorian era is a favorite of mine and also anything historical about the royals. Thanks for the chance to win this lovely book. I have always been very interested in Henry and all his wives, however, after discovering I am (a 1630's new Englander), related to Edward I through his daughter Elizabeth who married a de Bohun and on back, I have really started to delve into their History as well as those of Henry I, Henry II and William the Conqueror. So, I would say that is a time frame I would really like to know more about. It's definitely the Tudors. There is something fascinating about a man who had six wives and killed 2 of them. Anything from that time period is always fun to read about. I am really interested in this era as there are does not seem to be as many books about this era in British history in comparison with the Tudor era. Looking forward to reading this book and thanks for the opportunity to win it! I love reading anything historical. I suppose I'm really into reading about Nicholas II and Russia. Thank you for the contest! I like reading about the Tudors the most. However, I have enjoyed reading about the Russian Tsars & their families as well. Please count me in - Thanks! I like anything having to do with royalty from ancient history to modern day tales, but have a special fondness for stories about English and Russian royalty. I actually like the pioneering days of the 1700s and 1800s. The time of the Tudors. Please include me in your giveaway. I love the Tudor era. Henry and his wives, and the rest of the family members. I enjoy reading about the victorian period. I don't really have a favorite, I love Historical fiction in general and read pretty much anything that fits in that category! Thanks for the giveaway, this sounds like a great book! Entries are now closed! I will be announcing a winner very shortly!